Jason L. Riley on Race Relations and Law Enforcement Jason L. Riley is an editorial board member and a senior editorial page writer at the Wall Street Journal, where he writes on politics, economics, education, immigration, and race. He is also a FOX News contributor and appears regularly on Special Report with Bret Baier. Previously, he worked for USA Today and the Buffalo News. He earned a bachelor’s degree in English from the State University of New York at Buffalo. 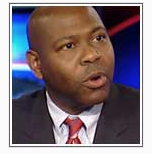 He is the author of Please Stop Helping Us: How Liberals Make It Harder for Blacks to Succeed.